“It went up and she thinks she’s a genius now." what we are seeing is what happens when governments get involved or interfere with the free market. Can you imagine what would happen to home prices in the US if the government gave all Realtors 30 days to shut. This is example why we should all oppose any expansion of government in our own countries, only vote for candidates that run on a limited government platform. 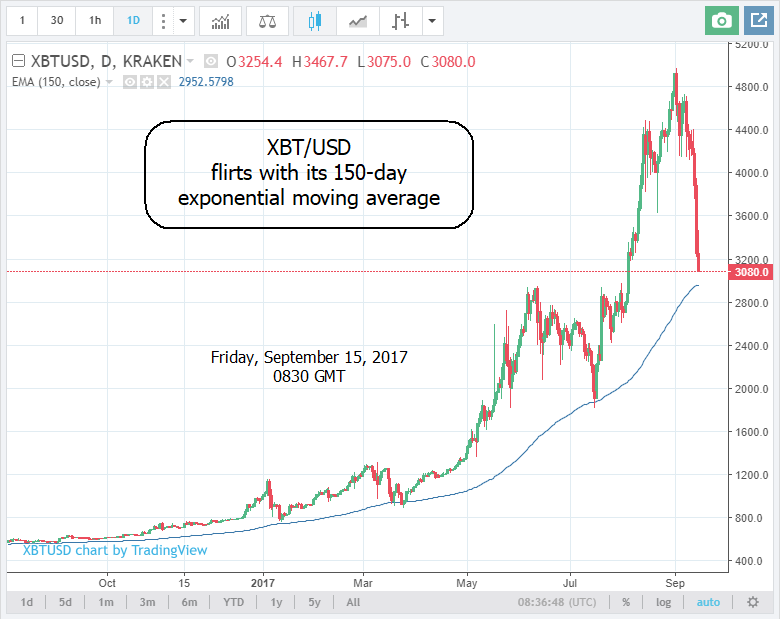 Reminds me of the Tulip Mania in 1637? Lets play a game of spot the difference…Ready, Steady and GO!! What a difference a few hours make, first chart is from this morning, Market cap below $100 Billion , second chart is a few min, ago, market cap back above $125 billion, that is a +25% change in about 7 hours. Also keep in mind that JP Morgan has a somewhat competing program, called Quorum, based on Ethereum. Not consumer focused like BTC. And there’s the same Jamie Dimon, just a couple days ago, stating “I’m not saying go short… Bitcoin can go $100,000 a bitcoin before it goes down, so this is not advice on what to do…” So a fraud, but could hit $100K. Even if it's not a long-term play. Where will the Chinese holders of bitcoin go now? Hold until the exchanges return, whenever that is? All Bitcoin exchanges in Beiing and Shanghai must submit plans for winding down operations. 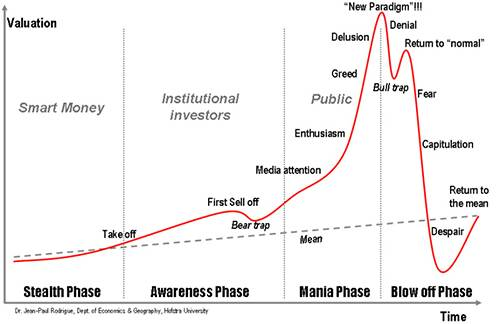 That chart reminds me of the SPX. The November issue of Modern Trader magazine has just come out in digital format. The print version will come straggling into our mailboxes sometime in the next couple of weeks. The first thing I read in this (or any) magazine is the Table of Contents, in order to prioritize my reading. 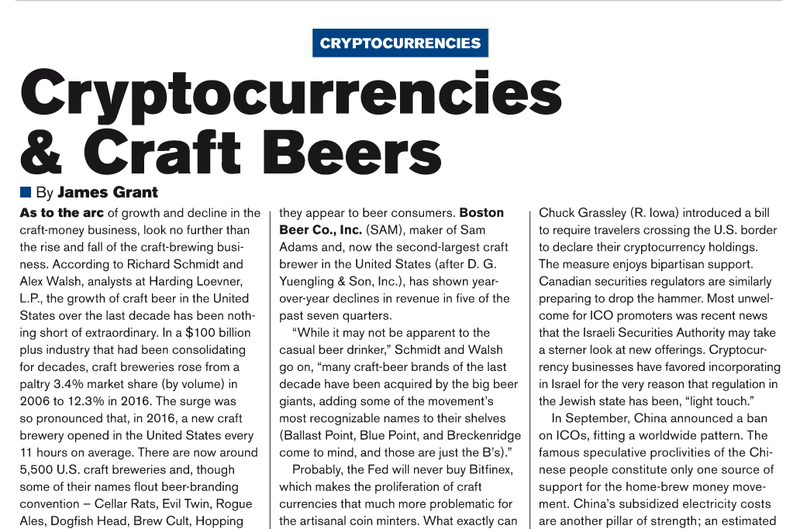 Today this caught my attention: Crytocurrencies and craft beers by James Grant, editor of Grant’s Interest Rate Observer. In my experience, you can take most of what Jim Grant says straight to the bank. 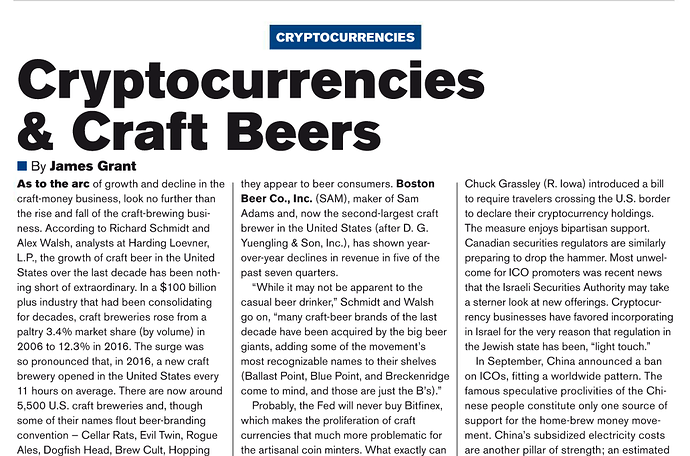 So, as a beer-tippler and bitcoin-dabbler, how could I not read his article on craft beer and “craft money”? I’m seriously considering choice #1. If I choose to go that route, I’ll copy-and-paste the article here. In the meantime, the gist of Grant’s article is that the craft beer market has grown dramatically, but individual craft breweries are cannibalizing each other’s market share. And Grant anticipates that the “craft money” market will follow a similar “arc” as it continues to grow. It seem that cryptocurrencies is having some trouble with China. I have a question, would someone as fickle minded like DONALD TRUMP endorse something like virtual cash? 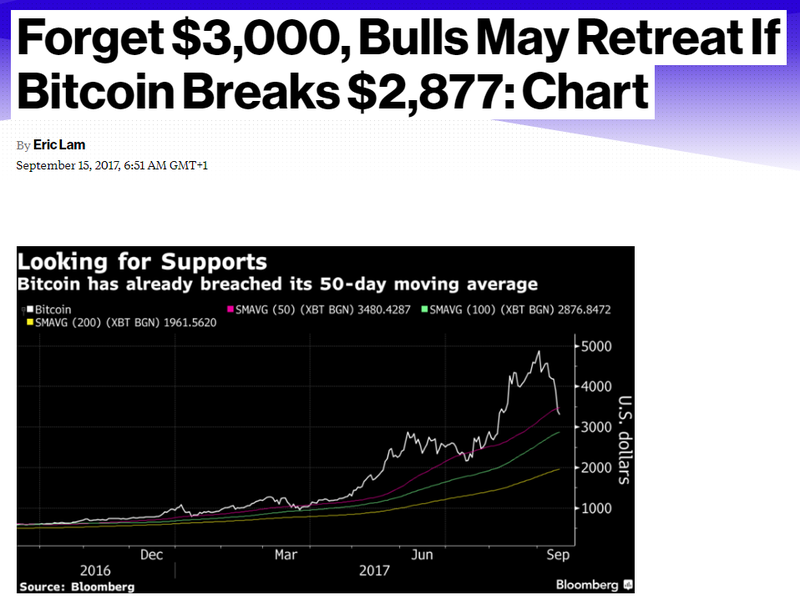 1.If he doesnt support it is pretty much the end for bitcoin. 2. If he does support, that really put bitcoin future into a state of mercury. In a nutshell, trading bitcoin is not risky but dangerous. 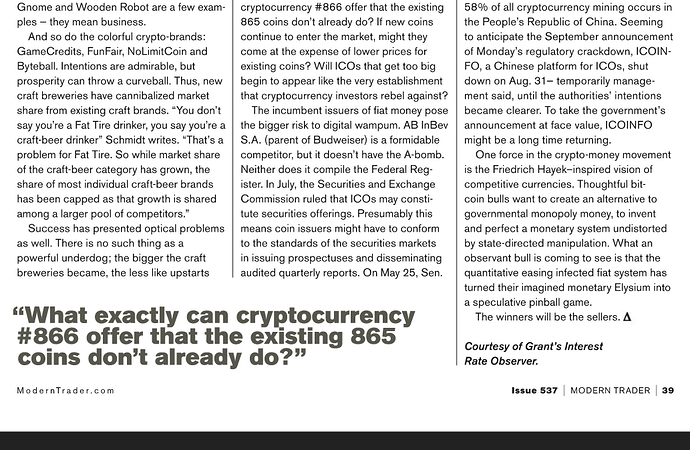 The cryptocurrency dropped to a low of $2,980 in mid-September on the news China had banned token sales and that local cryptocurrency exchanges would shut in the aftermath. 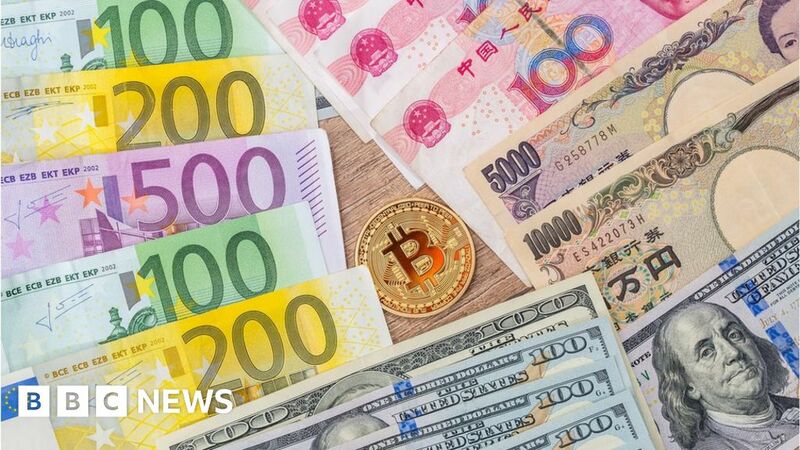 However, in subsequent days, bitcoin’s price quickly regained, reportedly due to a pick-up in trading volumes in Japan, South Korea and other markets. Bitcoins have been increasing each and every day and if reports or the rumors are to believed then it can touch 10K. And the pace at which it is going it doesn’t look impossible with 5200 already been achieved.